SQL Server on Linux has been out for a bit now and I’ve played around a little (see here) but haven’t really used it in “anger” nor will I for the foreseeable future if I’m honest. Nevertheless it’s an area that I find very interesting as I know very little when it comes to the Linux operating system and as it’s such a huge area, it’s something that I want to learn more about. I feel the best way to learn is to actually try and do something with it. Sure, I could sit down and read articles on the web but I learn best by doing. So I began to think about what would be the first thing I’d try and do if presented with an instance of SQL Server running on Linux that I had to manage. Right, well being a DBA, setting up backups and restores I guess but I want something a little more involved. How about setting up a warm standby instance! Log shipping! It’s perfect as it’s a fairly simple process within SQL but should teach me a bit about the Linux environment (copying files etc.) as SQL on Linux doesn’t have an Agent so this have to be done manually. I have published this as a purely academic exercise, I wanted to see if I could do it. At no point should this be considered to have followed best practices. This should NOT be used in a production environment. There are probably better ways of doing this, if you have one then let me know. The link will tell you to add unixodbc-dev to the end of the statement but that’s caused me issues in the past. Anyway, once that’s setup verify that you can connect to both instances, either by sqlcmd on the server or through SSMS remotely. Next thing to do is sort out access to these folders so that SQL Server can write backups to them. I found this kinda tricky if I’m honest as linux permissions are completely new to me but this is how I went about it. This will allow the owner of the folder (mssql) and members of the group mssql to do what they want. More details on setting permissions in linux can be found here. N.B.- I’ve noticed that even though the above permissions are correct to restore the log, this won’t work with sqlcmd. The work around I have is to make the logshipper login a member of the sysadmin role, not ideal I know. SQL Server Management Studio (SSMS) uses the Microsoft.NET FrameworkSqlClient for execution in regular and SQLCMD mode in Query Editor. When sqlcmd is run from the command line, sqlcmd uses the ODBC driver. Because different default options may apply, you might see different behavior when you execute the same query in SQL Server Management Studio in SQLCMD Mode and in the sqlcmd utility. I’m going to keep researching this to see what’s going on but for now let’s continue with the setup. Ok cool, barring some sqlcmd oddness, that’s our secondary SQL instance setup. By the way, did you get asked to enter your password to connect to the secondary server? That’s going to be a problem for us as we want to have the log shipping process running automatically. 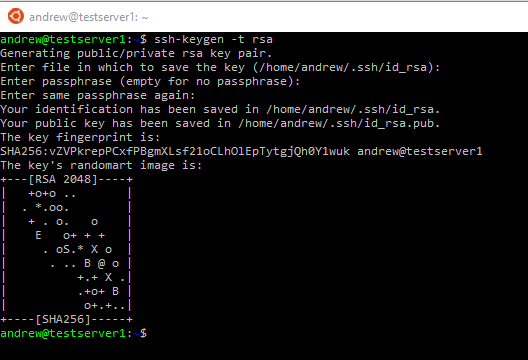 The way I sorted this was to setup public and private keys on the servers and then transfer the public key of server 1 to server 2. This then allows passwordless file transfers between the servers. The last line is important as it changes the settings of the keys folder to be restricted to the owner. Passwordless file transfer won’t work if access to the keys is too open. Nice and easy, this simply will create a time stamped transaction log of the database. Now what this is doing is selecting the most recent file in the backups folder and then using a program called rsync to copy the file to server 2. The reason I am using rsync is that I ran into the same issue with permissions that we corrected when copying the initial backups to server 2. The file that’s copied is owned by myself and as such the instance of SQL Server on server 2 couldn’t access it. What rsync allows you to do is setup the permissions of the copied file, so I used chmod 666 to allow everyone on server 2 to read and write the file (I know, I know). 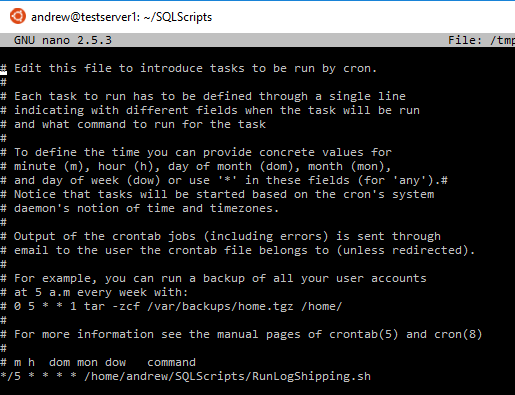 The script navigates to the SQLScripts folder, takes a backup using sqlcmd, waits 10 seconds and then copies the file across. Nice and easy again, simply using xp_dirtree to find the latest file (err..see below) in the backups folder and use that to restore the database. Now there’s a bug in the above script that stops it from selecting the most recent transaction log backup file. Instead of mucking about with xp_cmdshell I thought a simpler process would be to archive the files after they’re used (hence the Archive folder). So we need two more scripts to move the files and one to execute the restore and move. So we have all our scripts and a database ready to but how are we actually going to perform log shipping? 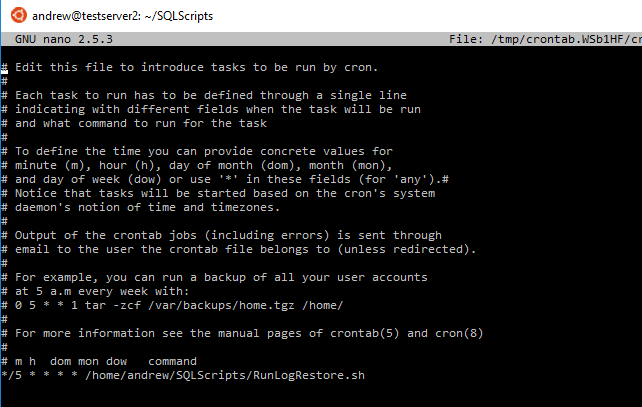 These SQL instances have no agent so the answer is crontab, a task scheduler that comes with Linux. What this is going to do is run that log shipping script every 5 mins. And what this code is going to do is look for the latest file in the SQLBackups folder, restore it and move the transaction log backup into the Archive folder every 5 minutes. Because of the 10 second delay in the log shipping script, the restored database on server 2 is always going to be 5 minutes behind. So we’re pretty much done! The last thing to do is monitor as the scripts will start to be executed automatically. Remember, it’ll take 10 mins for the restores to kick off as the way this has been setup is that the restore script will restore the transaction log backup taken 5 mins previously. You can see this above as the timestamp on the log backups is 5 mins behind the time of the restore. Phew! If you’ve made it this far then fair play to you. That was long and involved but good fun to try and figure out (if at times completely infuriating! 🙂 ). I know it’s very rough around the edges but I’m genuinely chuffed that I got it working and as the whole point was to learn more about the linux operating system, I feel it’s been worthwhile. This entry was posted in Backup & Recovery, Linux, Log Shipping. Bookmark the permalink. Very cool post Andrew! Check out the setgid bit, that will help you with the permissions gymnastics you’re having to do!